Tim, thanks for your feedback! That’s been an unfortunate glitch in one of the updates, but as of version 2.7 this problem is solved. Please get the latest version of the app and Master lists should work as expected. When I click on sublist only tree stores show up as options. How can I add more stores? Nancy, you can add stores under “All lists” tab. Just open “All lists” > tap Plus button > enter store name > confirm. Hopefully this helps. into the actual in-store shopping list. Thanks for the question. You can use any list under “List” tab for shopping. You can add items using Plus button or pick items from Pick list or Favorites. Please see User’s Guide for more details. How do I delete an item from my shopping list? 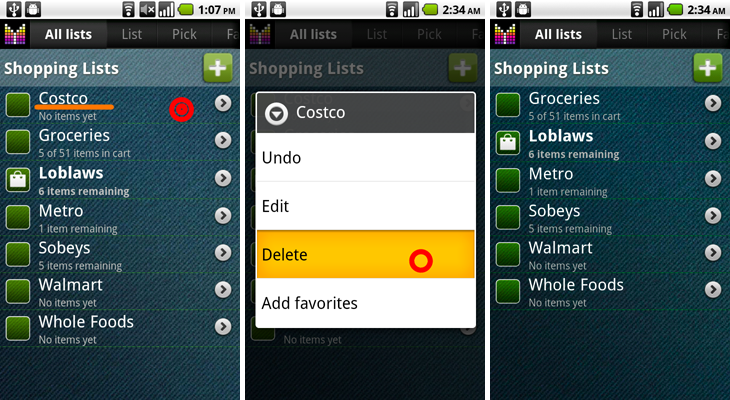 Liane, just long-tap an item and choose Delete to remove the item from shopping list. I love this app, but have one question: I’d like to have customized list of choices for each list, e.g., I need Pharmacy list to let me pick from pharmacy products only, when I want to add an item, and I want Grocery list not to let me pick pharmacy items. I thought this was possible by configuring list-specific favorites, so I tried to check the “List-Specific Favorites” option in config and I tried to populate the favorites list with a couple of items, but I keep seeing all of the long list when I click “+” in that list … what’s wrong? Alex, thanks for your feedback. 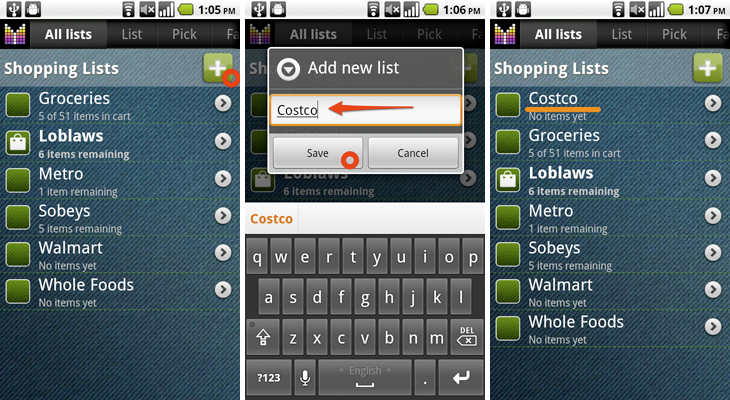 As you discovered, list-specific favorites allow you to organize favorites per your shopping list. 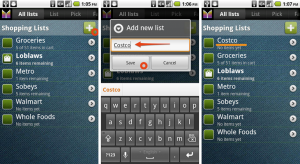 This allows quick scrolling through favorites list and one-tap adding to shopping list. However, your search selection won’t be limited to the Favorites list. This is an interesting idea though. We may consider this feature going forward. This gives a sense to the functionality. I, however, use to search for items with the + button, hence a filtering on the search selection would be very useful. Thank you for considering my idea. 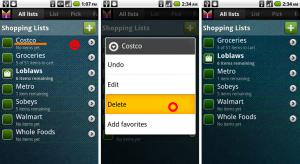 How can I delete list from my mighty grocery? I recently moved and some of the sotres I used are not available here. I have cleaned up list on my android but when I sync to web site old list remain. Judith, you can delete lists in the app under All lists –> long-tap list –> Delete. If you’d like to delete the list from cloud, just go to Menu –> Settings –> Accounts –> tap your account –> Cloud actions –> Delete lists –> select lists you’d like to delete –> Delete lists. Please let me know if you need any further assistance. 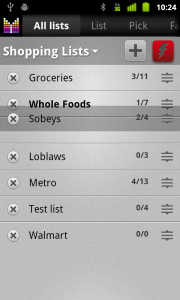 I have my lists in sync with my phone and tablet. I add new items to a list and make them favorites on the phone but they don’t appear on my tablet or vice versa. John, please make sure that both your handsets are logged in to the same account. You can check this in the app under Menu –> Settings –> Accounts. Please let me know if you need any further assistance. Sometimes I buy groceries in small local stores and most of the time in big super markets. I want the ability to put all together the local stores and big supermarkets under one master list. The problem is that small local stores doesn’t have all products (aisles) that big supermarkets have. I set all relevant aisles in each store. So I have in each store list only products (aisles) that I can buy. Now I want to be able to add all stuff that I want to buy to master list, and see in each store list only relevant products that I can buy in this specific store. Some products I can buy in several or in all stores (like bread, milk), so I want them to be shown in each of the store list, but some products I can buy in only specific stores, and I don’t want to see them on store list in which I can’t buy them. For now all products, that I add to master list, are shown in each sublist, no matter what the aisles settings is (even if there are no aisles at all). Yegor, thanks for your comment. If understand you correctly, you may need to add items directly to sub-lists instead of adding them to master list so that they won’t be visible under other sub-lists. Please let me know if you need any further assistance. I buy in stores of various sizes. I created a master list of all my products. Then I created my sub-lists as a variety of shops shop-A, shop-B, shop-C, etc. with the available aisles. Although I have at the various shops allocated the available aisles or voted out, I will always display all items, eg Shoes also in the little shop around the corner. It would be useful if when calling the sub-list shop-A aisles are not available are not displayed. Jo, I appreciate your feedback. Just to confirm — are you saying that items added directly to shop-A will also be listed when you open shop-B or shop-C? Hi Alex, no, that was not the problem. I have a master list of “products” (tomato + bread + shoes) with sublists “Shop-A” (only aisles vegetables + baked goods) and “Shop-B” (only aisles vegetables + clothing). In the list of “Products” I write everything I want to buy. If I buy in the Shop-A, then I want not to see the aisles/products that are not there to buy, so no shoes (aisle: clothes) but only tomato (aisles: vegetables) and bread (aisles: baked goods). Jo, I appreciate the details. We plan some improvements with Master lists & multiple store assignment of products in one of the upcoming updates. Please keep an eye on the What’s new page to see when it becomes available. Thanks again! I recently purchased this app. I’m not sure that it does exactly what I need. I am an extreme couponer, I need a master list (ex. GROCERIES), I then need sublists (ex. WALMART, PUBLIX, WINN DIXIE and HITCHCOCKS). Each sublist then needs its own list of items, set up so that each item has its individual unit price, discount, tax and subtotal. Each list then needs an individual list total. Can you please help me?? Angle, you might be interested in two features: Master lists and List-specific favorites. 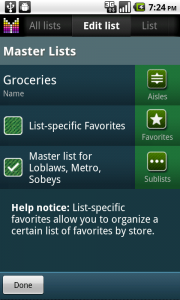 Master lists feature allows setting up a master list “Groceries” and add multiple sub-lists so you could see all your shopping items under one list. With List-specific Favorites you can set individual prices and discounts under each store. 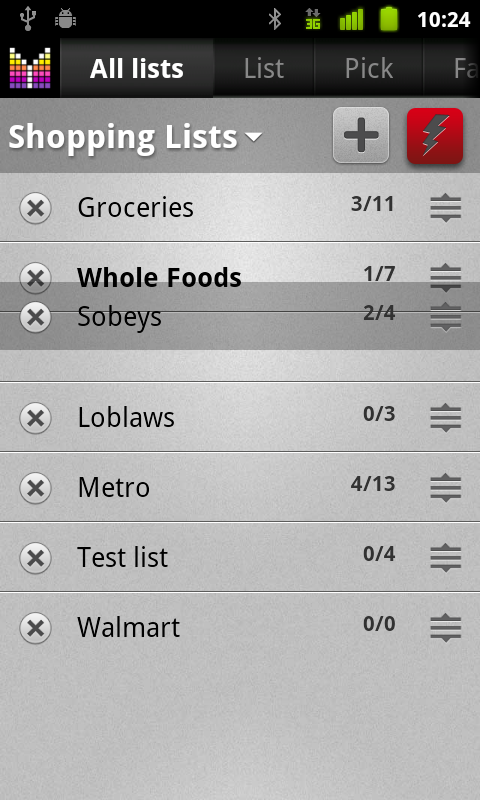 Then just add items to shopping lists and you’ll see individual list totals under each shopping list. Hopefully this makes sense. Please let me know if you need any further assistance. Now I go to Walmart first. I buy milk here. Next I go to NoFrills. I want to see milk already checked out because I bought it at Walmart. This part doesn’t work for me. If I use a master list and have Walmart, NoFrills and Home Depot lists as sub-lists then in the beginning I’ll have three sub-lists with three products each. I don’t want this as I’ll never buy bread at Home Depot. If I don’t use a master list then when I go NoFrills (my second stop) milk will still be on the list. I don’t want this either – I already bought milk. What am I doing wrong? What am I missing? Hi Pavel, in your example I’d recommend using master list for Walmart and NoFrills stores while keeping Home Depot independent. This will work fine for milk, but bread will also be listed under Walmart. We may consider improvements which will cover your scenario in full. Thank you.